Hero: President Hồ Chí Minh with Trưng Vương students. Photos courtesy of Trưng Vương Secondary School. A school with some of the prettiest - and toughest - students in North Việt Nam recently celebrated its 100th birthday. One of its pupils was Lê Thi, later to become a professor. She was one of two girls who hoisted the National Flag at Việt Nam’s first independence day at Ba Đình historical square on September 2,1945. Hà Nguyễn reports. Thousands of students and ex-students from Trưng Vương school, formerly known as Đồng Khánh, flocked from Việt Nam and abroad last week to Hà Nội to join a grand celebration for the school’s 100th anniversary (1917-2017). 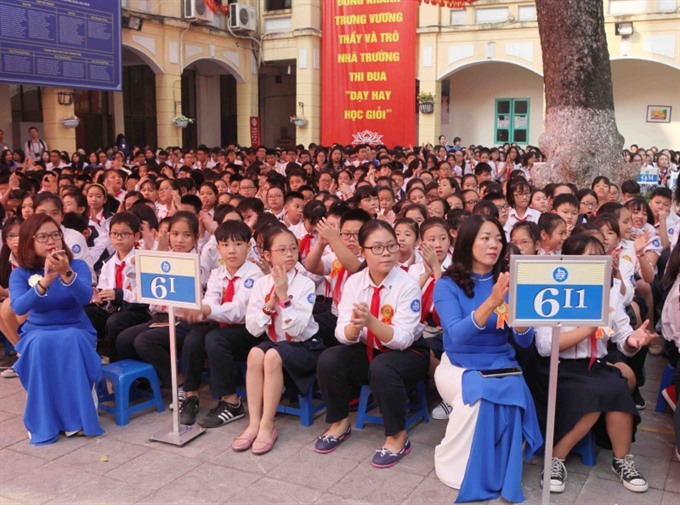 National Assembly Chairwoman Nguyễn Thị Kim Ngân attended, awarding an Independence Order, First Class, to the school. 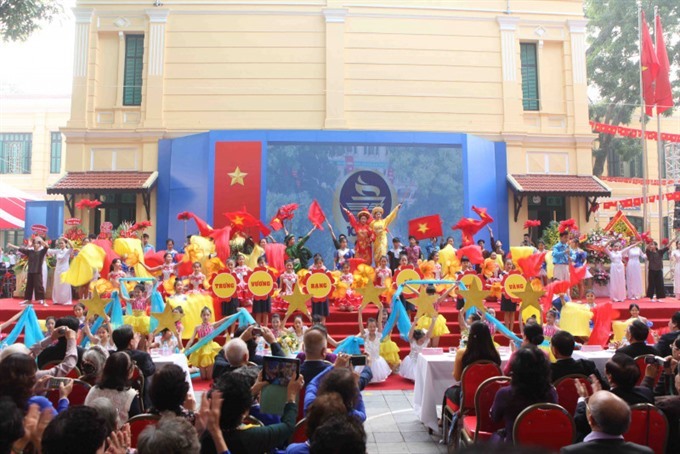 “ The State recognises the school for its great contributions to education in Hà Nội and the country,” she said. 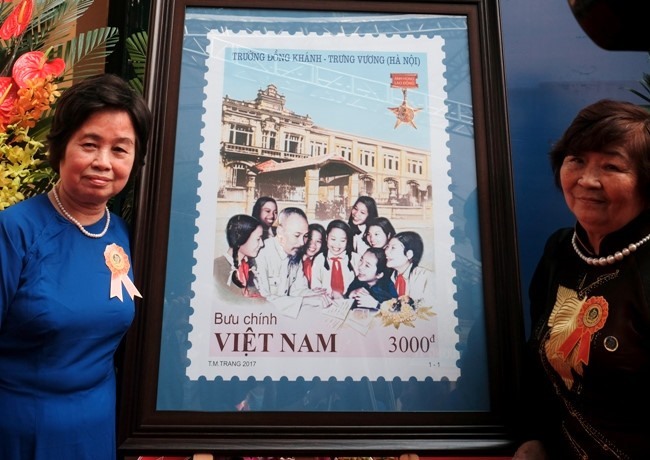 She also witnessed the release of a postal stamp collection on Đồng Khánh-Trưng Vương, which includes images of the school, President Hồ Chí Minh with school students and many others. The collection will be published and put on sale in 192 countries. The school’s old name was the Girls School of Đồng Khánh, which was established in 1917. 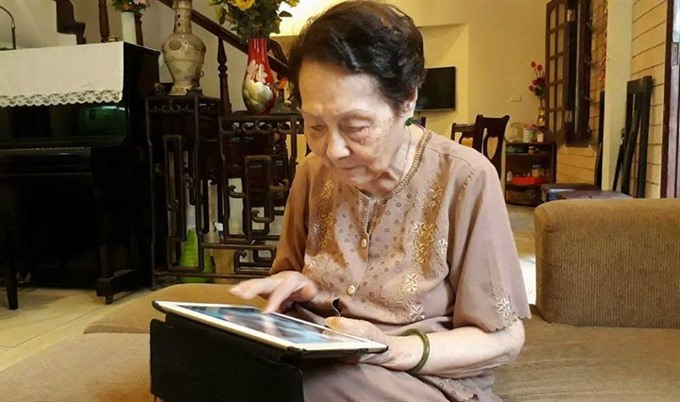 Viên Thị Thuận, 94, is one of the few living ex-students of Đồng Khánh, once the only secondary school for girls in the north of the country. She said the image of pretty, dreamy, innocent and slender school girls in their white áo dài (women’s traditional long robes) was an unforgettable memory for many old Hanoians. Many male students from other schools often came around to look or peep at girls when class was over. Unforgettable: Ninety four year old Viên Thị Thuận, an ex-student of Đồng Khánh girls school, dreams of the old days. To enroll at the school, students had to pass many strict examinations. “At the school, apart from learning lessons - and French - we learned domestic sciences, such as housework, cooking, needlework and household arts, such as singing, playing the piano and physical training,” Thuận said. In addition, the school taught students embroidery, how to bathe and take care of new born children - and how to spend time in their daily lives. The ex-Đồng Khánh student recalled: “At that time, we had a romantic life. We often exchanged views and noted love poems in our books. I had a friend, a daughter of a doctor. She felt in love with a handsome physics teacher. But she was very shy when discovered by her friends. Her sadness after her unrequited love finally ended when the teacher married another girl remains in notes by my friends of the time,” said Thuận. Another of Thuận’s classmates was Lê Thi, one of the two Đồng Khánh schoolgirls who hoisted the national flag at Việt Nam’s first Independence Day at Ba Đình Square on September 2, 1945. Lê Thi later became a professor. Comrades in arms: Lê Thi (white dress) and Tày woman Đàm Thị Loan were given the unparalleled honour of being the first people to hoist the national flag at the historic Ba Đình Square on Việt Nam’s first Independence Day, September 2 1945.-- Photo courtesy of Lê Thi. 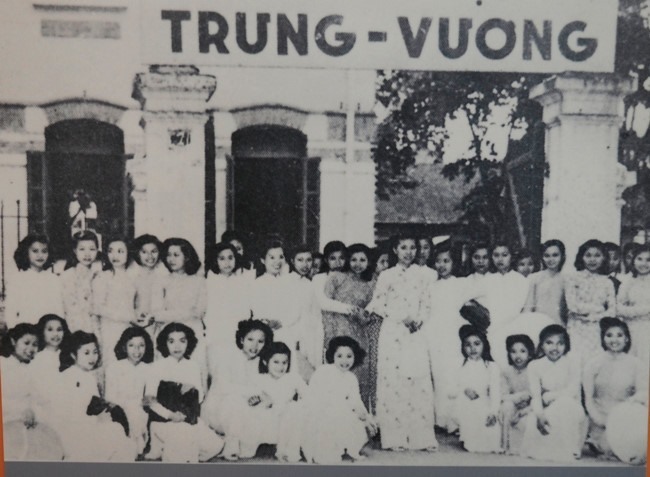 After the August Revolution against the French colonialists in 1945, the school was renamed as Trưng Vương, the name of the country’s first heroines to fight against the northern aggressors. In winter 1946, at the school itself, many revolutionary fighters, including Đồng Khánh schoolgirls, bravely struggled against the French. Twenty four young students died in the battle to defend the city. All in white: Female students in the old days. During the anti-American war, many Trưng Vương students left their text books to join the fight. 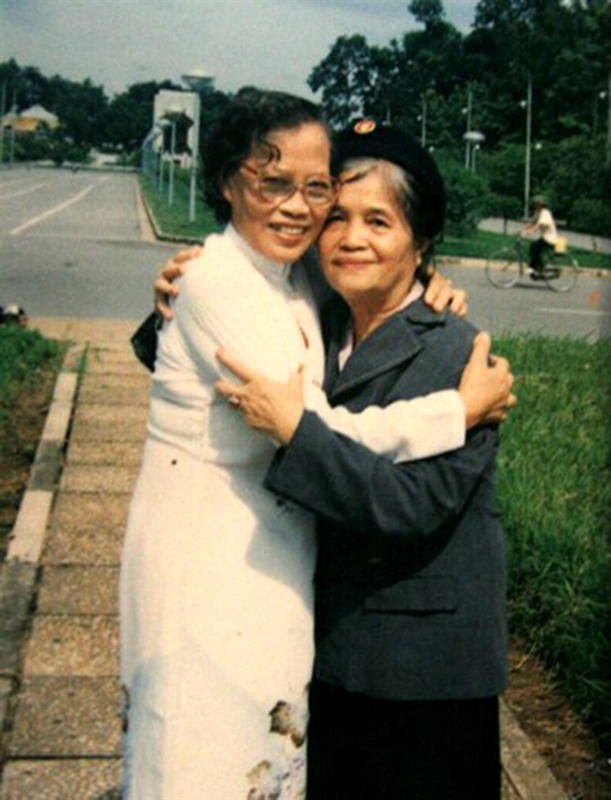 Many of them bravely sacrificed themselves for the country, including female writer Dương Thị Xuân Quý and artist Võ Thị Phương Thảo. 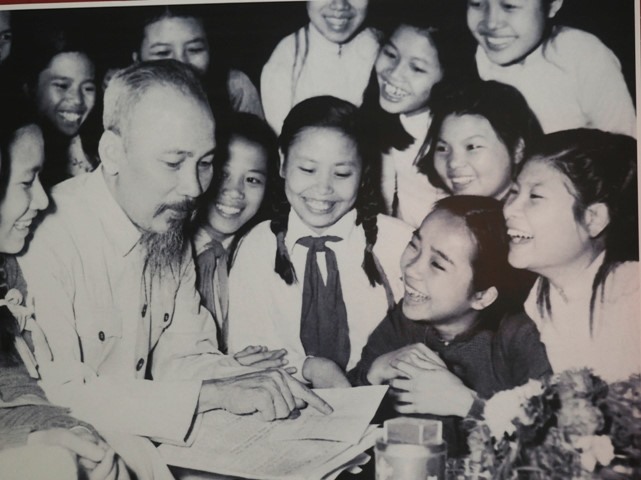 As a mark of his respect for the fight put up by the students, President Hồ Chí Minh visited the school five times, telling school teachers to practise well and students to learn well. “The Trưng Vương Secondary School is my second family. We received great love from our teachers, who always showed enthusiasm in teaching us,” said lawyer Đặng Tuyết Vinh, an ex-student of the school. “In third grade, I thanked my home-room teacher, Nguyễn Thị Nhung, who spent much effort helping me writing each letter and improving my maths. As a result, I earned marks nines and tens all year. Seven years studying at Trưng Vương was the most happy time of my childhood. Time has passed, but we’ll never forget the green leaves of the old trees, the loud drumbeats and rattling of the trams that used to run along Hàng Bài Street to Hoàn Kiếm Lake,” Vinh said. One of Vinh’s beloved teachers was Vũ Hữu Bình, who spent more than 30 years teaching maths. He said Trưng Vương was proud to have trained many maths students for Việt Nam, noting that the talent included Hoàng Xuân Sính, Việt Nam’s first doctor in maths, and Ngô Bảo Châu, the youngest professor in the country and the first Vietnamese awarded the Fields Maths Prize. One of the old students was Hoàng Lê Minh, the first Vietnamese to win a gold medal at the International Maths Olympic Contest in 1974. Other students later won gold medals in maths and physics at the International Olympic Contests such as Đàm Thanh Sơn, Đinh Sĩ Quảng, Vũ Hà Văn, and Đào Hải Long. Back home: Thousands of students flocked to the 100th anniversary of the Đồng Khánh-Trưng Vương School. Honour: One of several stamps made to honour the old school. Cheers: Festivities at the grand celebration. Apart from receiving the Lê Văn Thiêm Maths prize in 1999, Bình was awarded the People’s Teacher title by the State in 2002 for his great contribution to education. Besides teaching, Bình has written 167 books on maths. Each year he wrote four to 10 books and joined writing textbooks for secondary schools. Lê Hạnh, 76, from Hòa Bình Province, said Bình’s books were very helpful in his family’s education. Teacher Lại Cao Đắng from the Nguyễn Bỉnh Khiêm Secondary School in Đắk Lắk said most maths books on his bookshelf were Bình’s. Đoàn Công Hoàng, a student in Hà Nội’s Lại Yên Village in Đan Phượng District, said because his family was poor, they could not join extra classes so they often borrowed Bình’s books from the village library to learn maths at home. Trưng Vương was the first public school in Hà Nội to apply the STEM (Science, Technology, Engineering and Math ) method in 2012, said principal Trần Thị Thanh Thảo. Professor Nguyễn Minh Thuyết said STEM was not an independent subject, but an activity that reflected all school subjects and helped deal with reality. Lecturer Mạc Thị Thanh Bình, said teachers had to continuously prepare things and be creative to serve students. “We often organise field trips for teachers to keep up to date by attending exhibitions or events on science and technology,” she said. As a result, more than 800 students have joined STEM and more than 100 have been granted a certificate by the National Office of Intellectural Property of Việt Nam.